Last week we brought you the news that Onkyo had earned the Works with Sonos badge, with a hint that specific models and implementation would be announced on June 6. Turns out, that announcement came a little earlier than expected. The company has announced three new RZ Series receivers, ranging from $899 to $1,399, which will support Sonos by way of Sonos Connect. Functionality includes instant waking, input changing, and volume control, all via the Sonos app. For those of you in the back row who are thinking, "Meh," it's also worth noting that these new RZ Series receivers have been giving an upgrade from seven to nine amplified channels. For discerning home theater fans who desire the capabilities of a custom installed set-up, Onkyo USA has the solution as the company today announced its new 9.2-Channel Network A/V Receivers from its acclaimed RZ Series: the THX® Certified Select™ TX-RZ830 ($1,399 USD / $1,699.99 CAD) and TX-RZ730 9.2-Channel Network AV Receiver ($1,099 USD / $1,299.99 CAD), and the TX-RZ630 9.2-Channel Network AV Receiver ($899 USD / $1,049.99 CAD). Via the Sonos Connect, these new Onkyo RZ receivers carry 'Works with Sonos' certification and can now be part of your existing Sonos Home Sound System or the start of a new one. After a simple set up, these receivers will seamlessly tie into Sonos, instantly waking, changing inputs and playing at the volume you command through the familiar Sonos app. Once your Onkyo receiver is connected to the Sonos Connect, owners will be able to send any music or source on their Sonos app to the receiver. You can group your receiver to other Sonos devices on the network or use it independently. Firmware enabling this function will be available in early June. 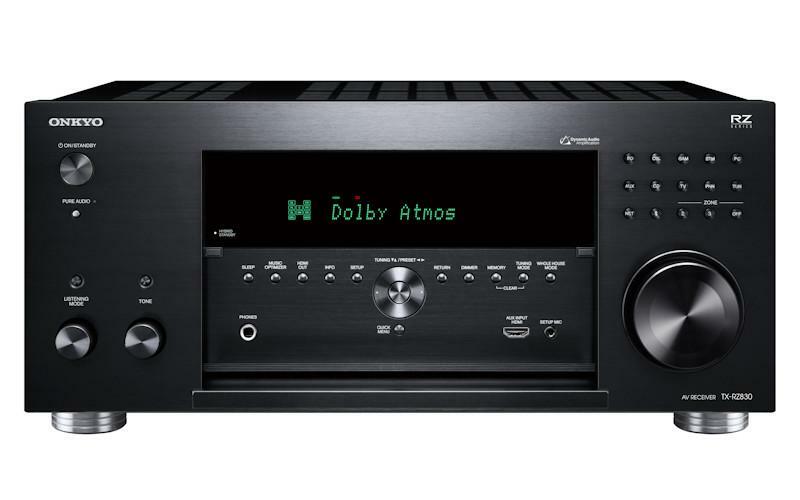 Onkyo's RZ Series takes performance and build-quality beyond your everyday receiver for a reference-grade experience. Custom high-current transformer, customized block capacitors join additional upgraded parts to deliver 5Hz-100 kHz frequency response for bone-breaking bass and crystalline treble. Each unit supports an array of home theater and multi-room layouts and, features such as a 12V trigger, RS-232C, IP Control and IR input make home integration easy. Adding to that ease of set-up is Onkyo's proprietary AccuEQ Advance room acoustic calibration technology. In addition to setting parameters such as speaker distance, SP level, and crossover, AccuEQ Advance uses multi-point measurement to eliminate standing waves from the listening space. The technology also detects and compensates for subtle background noise -- such as the hum of an HVAC -- to ensure accurate equalization. AccuReflex™ technology aligns the phase of directional and non-directional sounds for comfortable playback through Dolby Atmos-enabled speaker systems. The TX-RZ830 boasts 120 W/Ch (8 ohms, 20 Hz-20 kHz, 0.08% THD, 2 channels driven, FTC) or 250 W/Ch (6 ohms, 1 kHz, 10% THD, 1 channel driven) while the budget friendly TX-RZ730 has 100 W/Ch (8 ohms, 20 Hz-20 kHz, 0.08% THD, 2 channels driven, FTC) or 225 W/Ch ( 6 ohms, 1 kHz, 10% THD, 1 channel driven). Both are THX® Certified Select™ A/V receivers that deliver cinema-reference sound and are equipped with 11.2-multichannel pre-outs and processing to enable Dolby Atmos® and DTS:X® soundtrack reproduction though speaker layouts of up to 7.2.4-Ch (with outboard stereo amp). Owners can power digital and analog audio through speakers in Zone 2 and Zone 3 with a 5.2-ch speaker layout in the media room or enjoy object-based audio through a 5.2.2-ch layout with powered audio distribution in Zone 2. Both receivers include Zone 2 and Zone 3 pre-/line-outs to share audio to hi-fi systems in other rooms. At 90 W/Channel (8 ohms, 20 Hz-20 kHz, 0.08% THD, 2 channels driven, FTC) or 215 W/Channel (6 ohms, 1 kHz, 10% THD, 1 channel driven, the TX-RZ630 is a robust hub for whole-home entertainment and adds fully immersive 5.2.4-channel DTS:X® or Dolby Atmos® object-based surround-sound to stunning 4K HDR video. It can power speakers in Main, Zone 2, and Zone 3, and share audio to any supported hi-fi system via wireless platforms including Chromecast built-in, DTS Play-Fi® technology and FlareConnect™. Owners can also stream content over AirPlay, Wi-Fi®, or Bluetooth® wireless technology. All three receivers feature Dolby Surround and DTS Neural:X™ up-mixing solutions. These cross-compatible technologies remap legacy soundtracks commonly encoded on DVD, Blu-ray Disc™ and streaming video, unbinding the sound from the channel bed for spatial playback through any speaker layout to create a highly realistic listening environment. Dynamic Audio Amplification employs a custom-fabricated high-output transformer and large customized block capacitors to achieve class-beating current flow, the secret to instantaneous dynamic response and precise control. Non-phase-shift circuit topology on discrete wideband amplifiers limits distortion even at high volumes, while patented VLSC™ (Vector Linear Shaping Circuitry) on Front L/R channels eliminates digital noise for source-faithful audio playback. Support for network multi-room audio is comprehensive for all three units and includes Chromecast built-in, which allows users to stream any music from Chromecast-enabled apps, with playback controlled by voice with a smart speaker featuring the Google Assistant, such as Google Home. DTS Play-Fi® technology enables high-quality music playback from online services, media servers and mobile devices to any number of compatible products using Onkyo Music Control App and can synchronize music in every room. Proprietary FlareConnect™ technology shares audio between network sources and external audio inputs and compatible components for effortless multi-room playback of LP records, CDs, network music services and more. Amazon Music can be accessed via Onkyo Music Control App, while TIDAL, TuneIn, Deezer, and Spotify are easily enjoyed with Onkyo Controller. Onkyo Controller presents local and network audio for streaming together with remote-control functionality in a smooth and responsive interface. The receivers also include Bluetooth® wireless technology for streaming virtually any audio from apps running on PC and mobile. AirPlay network audio streaming technology is built in. Pure analog enthusiasts are treated to a discrete low-noise phono pre-amplifier for turntable connection--the TX-RZ830 adding Pure Audio mode to minimize unwanted interference. The TX-RZ730 and TX-RZ630 play DSD 5.6 MHz/2.8 MHz while the TX-RZ830 supports direct playback of DSD 11.2 MHz files. All three support 24-bit audio up to 192 kHz in FLAC, WAV (RIFF), AIFF and ALAC formats. On the video side, the three new RZ Series receivers are ready for the latest premium content with HDMI® pass-through of HDR10, HLG (Hybrid Log-Gamma), and Dolby Vision™ formats as well as 4K/60p, BT.2020, 4:4:4, 24-bit, and HDCP 2.2-protected video. Each RZ Series receiver offers consumers a robust home theater hub loaded with next-generation features at three individual price points to fit any home theater budget. More information can be found online at www.onkyousa.com.